A holiday tradition continued with the celebration of a Christmas Liturgy for staff, students and adults at the Barber National Institute. The Most Rev. Lawrence Persico, the new bishop for the Erie Diocese, presided at the liturgy that was held Friday Dec. 14 in the Institute's Forum. 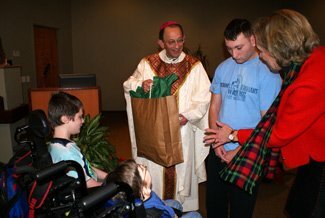 At the conclusion of the service, the Bishop was presented with two holiday donations. Shirley Johnson, president of the Employee Service Fund, presented a contribution to be relayed to Pope Benedict for the church’s work to help children around the world. Dr. Maureen Barber-Carey presented another gift for the Bishop’s charitable work from Touching the Lives of Children, an organization founded by Dr. Gertrude A. Barber to promote the health and welfare of children. Bishop Persico, accompanied by Fr. 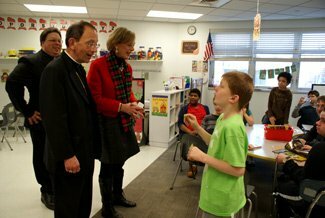 Jerry Priscaro, then toured the Elizabeth Lee Black School and the Adult Day Services on the Barber National Institute campus.